Jesse Hart’s goal Saturday night was to become the first fighter to stop veteran Thomas Awimbono. Not even Hart expected it to take just one minute and 28 seconds. Hart caught Awimbono with a right uppercut that dropped the fighter from Ghana just 1:05 into their scheduled 10-round super middleweight match in Corpus Christi, Texas. Awimbono got up, but Hart hit him with another right hand that dropped him to his knees and caused referee Lee Rogers to wave an end to their brief bout. 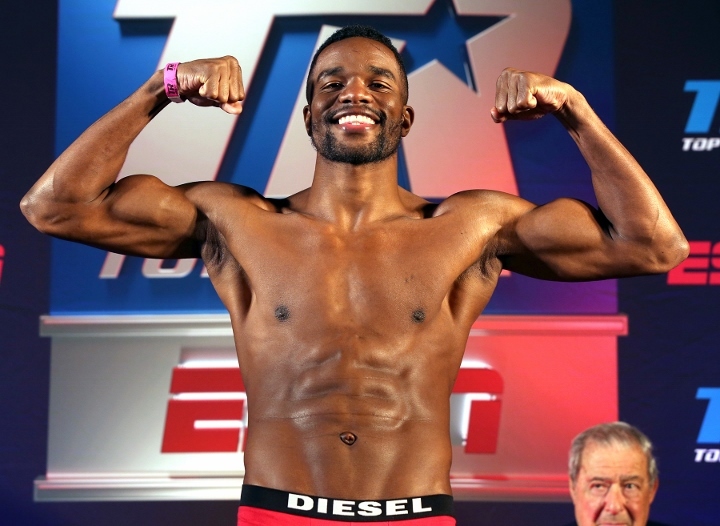 Philadelphia’s Hart (23-1, 19 KOs) scored a first-round knockout in his first fight since suffering his lone loss – a close, 12-round, unanimous-decision defeat to WBO super middleweight champ Gilberto Ramirez on September 22 in Tucson, Arizona. Hart, 28, fought Saturday night on the undercard of Ramirez’s optional title defense against Ghana’s Habib Ahmed at American Bank Center. The 37-year-old Awimbono (25-8-1, 21 KOs) lost a fourth straight fight. Immediately before Hart’s fight, Teofimo Lopez, one of boxing’s top prospects, out-classed Juan Pablo Sanchez with his hand speed, power and athleticism on his way to an easy unanimous-decision victory in a six-round junior welterweight fight. Lopez won by big margins on all three scorecards (60-54, 60-54, 59-55). The 20-year-old Lopez improved to 8-0, but an accidental clash of heads in the second round caused a deep, long cut over his left eye that could postpone his next fight. Las Vegas’ Lopez is scheduled to face Will Madera (11-0-1, 5 KOs), of Albany, New York, in an eight-rounder on the Jose Ramirez-Amir Imam undercard March 17 in The Theater at Madison Square Garden. Lopez, who fought for Honduras at the 2016 Summer Olympics in Rio de Janeiro, was particularly dominant throughout the fifth round. He continued toying with Sanchez during the sixth round, but he couldn’t drop the tough veteran from Mexico. Sanchez, 29, has lost four of his past five fights (30-15, 14 KOs, 1 NC). He was a late replacement for John Delperdang (10-4, 9 KOs). Earlier Saturday night, 17-year-old super featherweight prospect Gabriel Flores Jr. needed just 2:31 to dispose of Alex Solorio in a fight that was scheduled for six rounds. Flores (6-0, 5 KOs), of Stockton, California, landed several combinations during their short, one-sided fight. He stopped Mexico’s Solorio (4-3, 1 KO) with Solorio still standing because Solorio wasn’t throwing punches back at Flores.